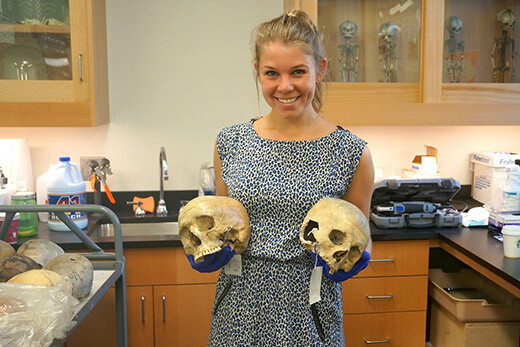 "Anthropological genetics is a huge and growing field," says Kendra Sirak. The Emory graduate student has developed a specialized technique for drilling into ancient skulls to remove DNA samples. Photo by Kristin Stewardson. “Wherever I travel, I take my bone drill with me,” says Kendra Sirak. Sirak drills the base of an ancient skull. An Emory PhD candidate in anthropology, Sirak has developed a specialized technique for drilling into ancient skulls to remove DNA samples. She’s flown to more than a dozen countries and drilled more than 1,000 skulls, perfecting the technique. “No one at customs has ever questioned me about why I’m carrying a gigantic drill in my suitcase,” she notes. Sirak has the distinction of being the last graduate student of the late George Armelagos, Goodrich C. White Professor of Anthropology. Armelagos, who died in 2014 at the age of 77, was one of the founders of the field of paleopathology. He spent decades working with graduate students to study the bones of ancient Sudanese Nubians to learn about patterns of health, illness and death in the past. The only piece missing in studies of this population was genetic analysis. So in 2013, Armelagos sent Sirak to one of the best ancient DNA labs in the world, University College Dublin, with samples of the Nubian bones. Sirak soon became hooked when she saw how she could combine her interest in ancient bones with insights from DNA. She formed collaborations not just in Dublin but at Harvard Medical School’s Department of Genetics and elsewhere, working on unsolved mysteries surrounding deaths going back anywhere from decades to ancient times.